From the beginning of human history, each generation has taken on guilt and passed it down to the children. Parents, children, friends, spouses, partners and others have used guilt for behavior modification, punishment and revenge. Institutions like businesses, governments and religions have used guilt to keep people in line. Guilt is so much a part of the fabric of our culture that it seems quite radical to suggest that it’s been a mistake. But it has. Guilt (and its relations, shame and blame) have been a plague that has cost humanity untold pain, suffering and despair. They’ve too often caused us to feel bad about ourselves and to do less than our best. Many believe that guilt is a feeling. However, on closer examination it’s clear that guilt is a mental thing that ‘infects’ feelings. It’s like a foreign substance that gets into or around emotions, like an infection in a wound. Emotions, even the powerful negative ones, are meant to be felt and moved. Without guilt, feelings like grief, fear or anger can flow smoothly and move through us. We feel the feeling – and then it’s gone, leaving a space that can later be filled with joy, excitement, power or other emotions. For instance, grief without guilt feels warm and smooth, like love. Fear without guilt feels like excitement or anticipation. Anger without guilt feels like power. However, emotions with guilt in them are much more difficult to feel. They hurt. Guilt in or around a feeling causes it to abruptly stop and start again. This jerkiness in the otherwise smoothly flowing feeling causes a pain-like sensation we interpret as ‘feeling guilty’. The easiest way to deal with feelings infected with guilt has been to deny the feelings. For many of us this has been crucial to maintaining self-esteem and keeping our optimism high enough to go on with life. The problem with this is that denied feelings don’t go away, they submerge and stay unconscious. This creates an opening for the split off parts of us (that experienced the feelings and are now unconscious) to repeat destructive or unwanted patterns of behavior. Denial is only a coping mechanism. Real healing can come only when the feelings are felt and the guilt is confronted and removed. Although the suggested practice that follows is very easy to do, it can facilitate very deep healing. The truth is that you and I, everyone… we are all innocent. 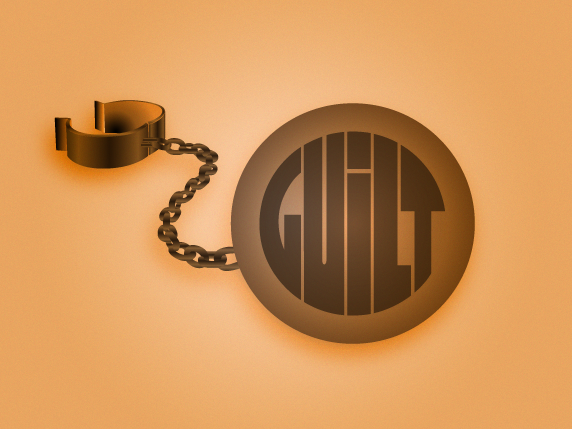 Many have believed that guilt has been necessary to keep us from doing ‘wrong’ things. But this isn’t true, a good conscience does not depend on guilt, but rather on a self-assured sense of what is right and wrong. In fact, guilt erodes conscience by degrading self-esteem and even causing self-hatred. With enough guilt, a person can get in a position where they feel obliged to prove to themselves and the world just how bad they are. Also, because emotions with guilt are hard to feel – they get denied, and are no longer available to us. Without honest feelings to inform us, it is difficult to achieve that self-assured sense of right and wrong that makes a good conscience. The healing of guilt is in releasing the judgments that hold guilt in place. In healing guilt it is important to remember that we are here to learn. Learning is a trial and error enterprise. Sometimes we make mistakes, we do things we don’t wish to repeat. So we learn. If, however, in the learning process we get infected with guilt – we then feel bad, sometimes really bad. A learning experience turns into an internal crime and courtroom scene with the feeling of guilt as the primary punishment. Learning is part of growing and evolving, and mistakes are excellent feedback in the learning process, if they are used as such. Our culture has taught us that making mistakes is bad, but this is not true. Mistakes are the norm in trial and error learning, and in fact they are necessary for learning and evolution. Learning is already hard enough without being punished for the mistakes that are a necessary part of the process. The punishment and obvious result of negative judgments is guilt. Guilt erodes the sense of self worth and makes it very difficult to feel feelings that have been infected with it. Depression is often the consequence of guilt-bound feelings that cannot move and are therefore denied. Guilt is held in place by judgments. Release the judgments, and the guilt goes too. And because judgments are decisions, they are easy to change. The secret is simply to decide again. Take back your original judgment, change your mind, undecide, unjudge. There is a powerful step-by-step Process Coaching practice of Judgment Release that makes it very easy to heal guilt, blame and shame. Before reading on, do this now to understand how powerful and easy it is to heal guilt in yourself. Whatever it was that caused you to judge against yourself, it’s not wrong, it’s a choice. We have free will and every choice we make is valid, and particularly valid when it’s used as a learning experience. Release each negative judgment until there are no more. That’s all there is to it, when the judgments are released you are free again to decide about how you will feel and act in this and similar situations. Guilt and blame are a continuum. When it is in us, it is guilt. When it is in someone else, it is blame. Guilt we feel impossible to own ourselves becomes blame when it is projected out onto another. Releasing judgments (blame) against others is just as liberating as releasing them against ourselves. Just say, “I release the judgment that (person’s name) is bad because they . . .” and “I release the judgment that . . . is bad or wrong.” Either way, guilt or blame, it’s ours to release. Does it seem too easy? You may find yourself very pleasantly surprised at the deep and permanent positive changes that occur when judgments are released. At first it may seem like nothing has happened, no thunderbolts or deep feelings need accompany the quiet release of judgments. Judgment making is a mental activity, and so is judgment releasing. Although these mental constructs have a very powerful influence over emotions, they are as easy to release as forming the intention and thinking the thought. The effects of judgment release are often subtle at first, but always cumulative. The more often you stop to release judgments when something bothers you, the easier it goes next time. Also, after just a little practice, the releases will go very quickly. After some practice, often all that is necessary is to realize you’ve had the judgment, and it will automatically release. RELEASE THE GUILT & SHAME: Affirmation of Letting Go…. Today, I want to release All need for guilt & shame, anger & resentments. I am willing to release the need for guilt & shame. I release the pattern in my consciousness that has created these conditions. I order them wiped out, erased, eliminated, neutralized, released. I affirm that I am now free of them. I affirm that I am willing to release the causes; the patterns in my consciousness that are creating any negative conditions in my life now. I am willing to release the need for these conditions. I allow them to disappear, to fade away, to dissolve back into the nothingness from whence it came. I am willing to stop mentally rejecting what I say I want. I am now FREE. I am FREE of the past. The old garbage no longer has a hold on me. I am now Free. I create in the present moment with the power of my own mind that which I now desire. My current thoughts are always creating my future. Now I will do this consciously. That which I need to know is revealed to me, & whatever I need comes to me. I am divinely protected & guided, & my way is made smooth and easy. Anger & resentment & blame. I consciously dissolve that. I release the need for anger & resentment & blame. I truly forgive all of those that need forgiving & I forgive myself. I look forward to this day with love & peace & joy & anticipation of abundant good in every area. This is a healthy, harmonious, loving, prosperous & creative day for me. It is filled with Joy. I welcome change & adventure. I bring new experiences & new people into my life. Let this day be filled with love for me. Let this day be peaceful & calm. Let this day bring new insights, new understandings. Let this day bring unexpected prosperity. Let this be a day of great joy. This is my day. This is a good day. It is a new day. This is one of the best days I have ever had. This is a new beginning.